The extraordinary in the ordinary for me, took place on our January trip to Siem Reap Cambodia. I was taken by the beautiful shape of the garbage bins [trash cans] I kept seeing on the streets. 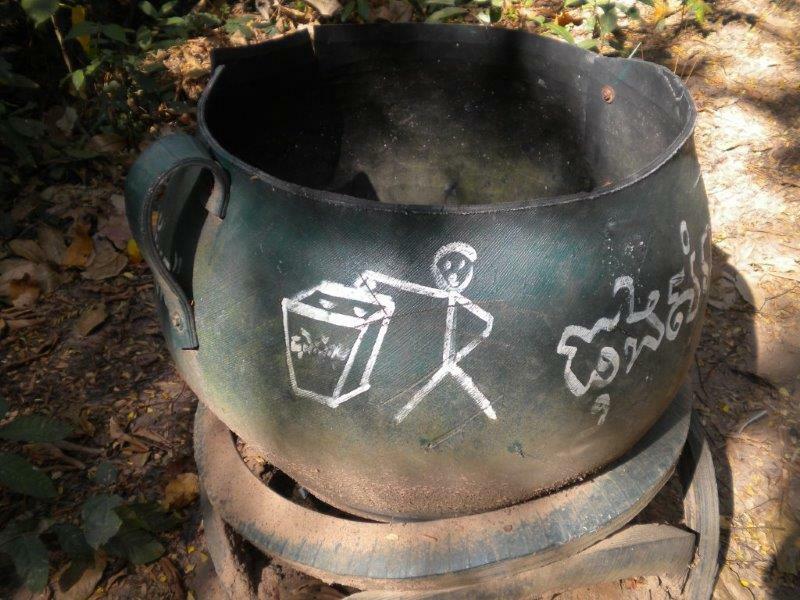 The humble garbage bin is transformed into an item of beauty when old truck tyres are repurposed. When first glimpsed from a speeding taxi, I thought the large 'pot' was for cooking. 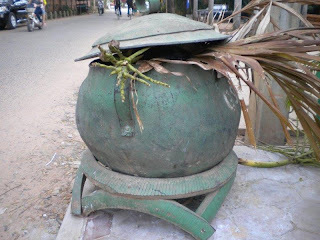 However on a subsequent neighbourhood walk, I discovered the real purpose of the big pot! 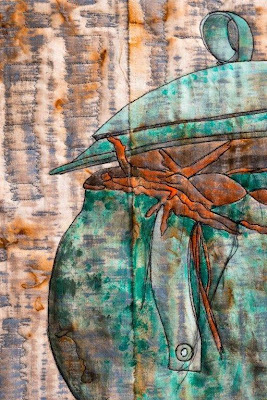 The background fabric was rusted in Australia and then a Cambodian floor mat used for the rubbing. The pot was hand drawn and painted. In keeping with the 'rubbish' theme of the work, loose thread ends and raw edges finish the piece which is backed with cotton fabric dyed in a waste product- brown onion skins. Materials: 100% cotton fabric, fabric paint, wadding. Techniques: Hand rusted, rubbed and painted, machine pieced, machine quilted. I'm a follower immediatly.Great technics. love the way your rusted work works with the whole theme of the piece! Looks great Sue. Rusting works well with the rubbing. Wow! That's great - I love the rusting. Is the whole thing made of rubber? Definitely is an extraordinary/ordinary! Yes, it is all made from the tyre! Amazing! At first I thought this would be too lowly for the challenge, but decided it was something extraordinary so ran with it. Having made the rubbings in the country only added to the sense of place for me. Amazing Sue. What a great rendition of the pot! I am looking at old tires in a whole new way! Amazing! You open my new view! The technique is new to me! Many thanks! 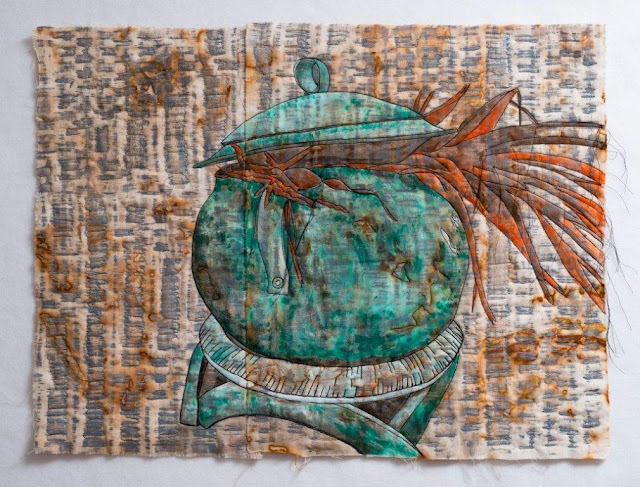 I love the entire piece; the rusting, the rubbing of a mat, the painting of the pot. A beautiful rendition of an ordinary object made extraordinary! Just wonderful!